With just a few simple supplies you can make these Mason Jar Lights. 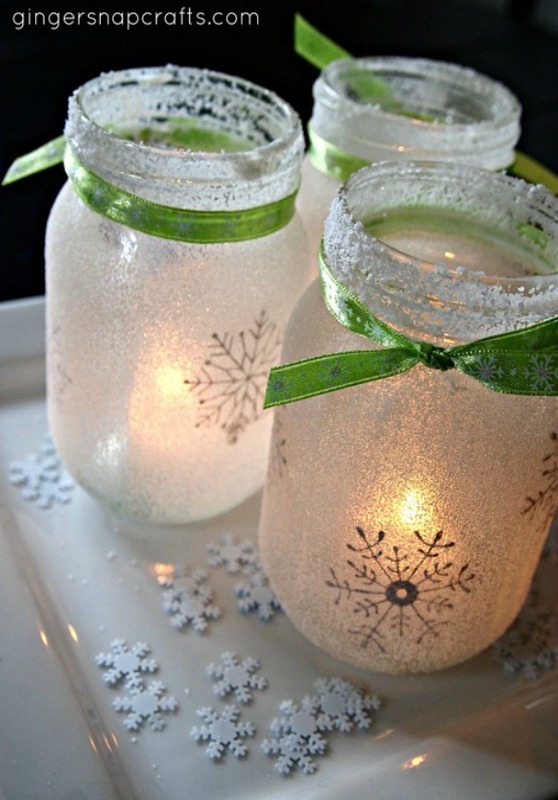 Light up your holiday table with these gorgeous and easy to make Mason Jar Luminaries. They are perfect for decorating or quick Christmas crafts. 100 Days of Homemade Holiday Inspiration continues with Day 19! Each day we are inspiring you with recipes, decorating ideas, crafts, homemade gift ideas and much more! During the Christmas holiday I love to have our room lit by Christmas tree lights and candles only. These Mason Jar Luminaries would go perfectly on my table. Thanks to Ginger from Ginger Snap Craft for sharing the Mason Jar Lights with us for our 100 Days of Homemade Holiday Inspiration! Do you store these and use them year after year? Hi Jan, the gal that made the mason jar lights said that she did not store them. I would think they might flake off if stored, although you could try and pack them well in a box. How were they done? Epson salt but I love the snowflake on them. Diane, if you click on the link where it says “Mason Jar Lights” it tells you how to make them. Thank you now I see it. I love the red/white trees you did. Or have pictures of.